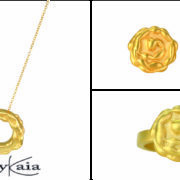 Give her the gift of fine gold jewelry, which expresses how strong, brilliant, and everlasting your true love is. Write a romantic poem either in your own words, or from another poetic author. Take a long weekend, and go to a bed and breakfast to a place you have never been. Take a long leisurely walk, in a relaxing place, while holding hands. Do not wait until Valentines Day to show your love and appreciation for each other.